The Air Force Research Laboratory (AFRL) is building and demonstrating a new class of low-cost satellites – referred to as micro-satellites – weighing less than 100 kilograms. These new satellites are being flown under the XSS (Experimental Small Satellite) Microsatellite Demonstration Project. 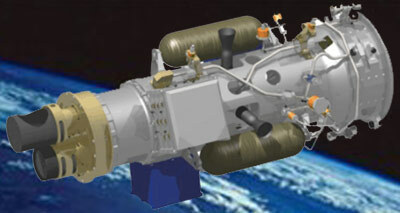 In conjunction with the Air Force Space Command, Air Force Space and Missiles Systems Center, the Naval Research Laboratory, and industry, missions are underway to actively evaluate future applications of micro-satellite technologies to include: inspection; rendezvous and docking; repositioning; and techniques for closein proximity maneuvering around on orbit assets. XSS-10 (Experimental Small Satellite 10), a 28 kilogram microsatellite, was launched as a secondary payload aboard a Delta-7925 launch vehicle carrying a Global Positioning Satellite (GPS) satellite. This mission demonstrated the complex interactions of line-of-sight guidance with basic inertial maneuvering. It was launched on January, 29. 2003. The micro-satellite was attached to the Delta-7925 second stage. Once the second stage separated from the GPS-2R 8 satellite, the microsatellite waited for a sunlit Air Force Space Control Network pass before ejecting from the second stage. Once ejected, the microsatellite commenced an autonomous inspection sequence around the second stage, and live video was transmitted to ground stations. The entire mission lasted approximately 24 hours. The XSS-10 proved that small autonomous spacecraft can be used to come close to other spacecraft in orbit. During this mission, the XSS-10 traveled within 100 meters of the second-stage booster of the Delta-7925 rocket, to take photographs and transmit the images back to ground from a low-Earth orbital position 800 kilometers above the equator.